Folks who don’t regularly shop at farmers’ markets often wonder how the pricing compares to what they typically find at the grocery store. Though prices at farmers’ markets can vary greatly across the state (tomatoes, for example, may range anywhere from 50 cents to $4 per pound depending on location and time of year), shoppers sometimes find that prices can be a little higher than those at the big supermarkets like Walmart or Smiths. It’s not a simple comparison, however. Small-scale farmers who sell at local farmers’ and growers’ markets price their produce based on the true cost of growing the food. Farmers of commercial commodity crops, on the other hand, receive large subsidies from the government and rely on cheap oil for transportation as well as cheap labor for production. Consumers may not be paying the full price of commercial produce at the checkout counter, but they do eventually pay for it come tax time. In addition to paying fair labor and transportation costs, local growers tend to avoid the cheap chemicals of commercial agriculture, opting instead for organic solutions and more intensive labor when it comes to problems like pests, weeds, and diseases. These approaches that work in tune with nature, rather than against it, tend to cost more. Beyond the policy and production cost reasons for the price discrepancy, consumers can also consider the quality of the produce they buy. Anyone who has ever raised a garden or bought a tomato from a local grower can tell you that there is simply no comparison to what you get at the supermarket. Produce sold in supermarkets has been picked before it’s ripe so that it can last during transportation. According to the Worldwatch Institute, American food travels an average distance of 1,500 to 2,000 miles from farm to fork. Not only does picking produce too early reduce the amount of nutrients in the food, but it also reduces the flavor. Fully ripe fruits and vegetables that have been picked anywhere from a couple hours to a couple days before you eat them teach you what real food tastes like. Farmers’ markets are a great way to eat in a way that’s good for our local economy, our health, our environment, and our tastebuds. 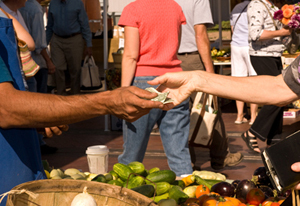 Whether you use your SNAP card, your WIC or Senior benefits, your debit card, or plain old cash, spending food dollars at farmers’ markets is a way to show that you care about where your food comes from and the future of real food.